This month is starting off with cool, crisp air & a gray sky. I'm not complaining because this is my favorite kind of weather and we here in San Diego really need a break from the 365 day heat wave. I also love being able to use our fireplace, light some candles, and cozy up with a blanket - which feels the most comfortable when it's not 90+ degrees outside and inside our home. So I'm currently happy. I left October with a sense of Focus and I've begun to change a few things in my life in hopes of preparing for 2018 to be a great year. One of the many things I love about October is how easy it is for me to connect to. I'm not sure why, but I feel like October is the one month when everything slows down and allows us to have time to stop and think about the things going on around us. And that's what I do every time October comes around. I stop, I take a deep breath, and I take time to focus on what's important. 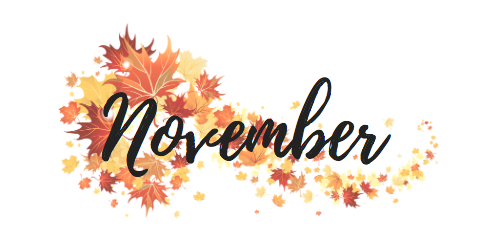 After taking some time to think about what I want to focus on and what's important in my life, I like to head into November feeling gratitude. November is the time of year when we get to be Thankful for all that we have, and although I think we should constantly be thankful for what we have in our lives, sometimes we just need a whole month dedicated to actually being Thankful. I get it, once life happens and we get busy it's hard to stop for a minute to say Thank You. And that's what I love November - it's a constant reminder. So I'm starting - Today - to Focus more on the important things. And on the things & people that I have in my life to be thankful for. I truly believe that November is going to be a great one. What are 5 things you are Thankful that you get to Focus on? Love without Fear, Love without Expecting..Love, Love, Love!